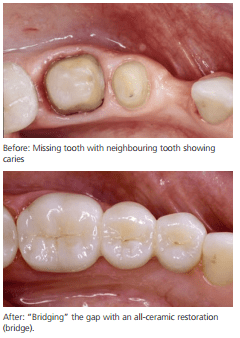 Are you looking for an affordable solution to replace a missing tooth? Maybe you have previously looked at removable restorations such as partial dentures. A fixed or permanent restoration could be more convenient. Without question a fixed dental restorations like dental implants are the gold standard for replacing missing teeth, but a more affordable and non-surgical solution is a bridge. A bridge is a fixed restoration that is secured into place by attaching it to your teeth for support and stability. The reason this type of restoration is called a bridge is that it simply bridges the gap created by one or more missing teeth. The materials used for bridges include porcelain bonded to non-precious or precious metals, or to a zirconium base for a more aesthetic result. If you have a missing tooth and feel a bridge could provide you with a suitable restorative solution, we will be happy to discuss this during a complimentary consultation with you here at City Dental Practice. For more information about bridges or to book an appointment to discuss this treatment with me in more detail, please call my friendly reception team on 0121 455 9233.